A birch tree is a thinleaved deciduous hardwood tree of the genus Betula. They are in the family Betulaceae, which also includes alders, hazels, and hornbeams. Betula contains 30 to 60 species of which 11 are on the IUCN 2011 Green List of Threatened Species. They are usually rather short-lived pioneer species widespread in the Northern Hemisphere. ↑ Ashburner K. & McAllister H.A. 2013. 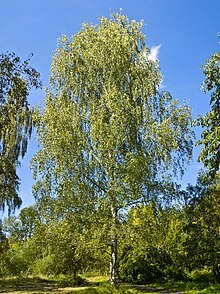 The genus Betula: a taxonomic revision of birches. Royal Botanic Gardens, Kew. This page was last changed on 26 May 2016, at 13:09.